I chose this book because it taught me how important it is that your business represents you and that you passionately believe in it. I also learned from it the importance of organizational culture, and that the endpoint of a sale should always be customer's happiness, not the money-product/service exchange. Ever since I wanted to create my own company, I wanted to create one that offers an amazing customer experience. This book was a big inspiration. 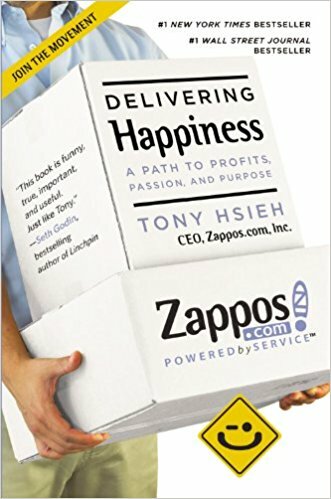 Delivering Happiness by Tony Hsieh inspired what I think of customer service ever since I read it. The biography of Zappos' founder. Interesting journey. You learn the importance of customer happiness. I really, really like company biographies. They're just kind of the style of book that I've gotten really into. [...] I've read the Happiness book by the Zappos CEO. I'm a big customer service guy. That's my background. When I was in college I worked at Firestone. They really preached it to me from day one, which gave me a huge advantage when I worked as a seller on Amazon and when I started my Amazon business. I always recommend Zappos, the Pursuit of Happiness, where they just talk about how customer service needs to be the backbone of your company. We talked a little bit about this a little already, how your first 100, 500 clients are so key and making them happy. If you don't understand customer service, if you don't understand what goes through a customer's head, you're never going to be able to do that effectively. The Zappos story opened my mind to Entrepreneurship and business building. I read this book in high school and it probably had something to do with my choice to major in Entrepreneurship at Babson College. I met my co-founder while at college and am subsequently building a technology start-up as we speak. We try to deliver happiness everyday and customer centricity is a pillar of our business. In this book, it shows how serial entrepreneur Tony shares the different lessons he has learned in business and life, from starting a worm farm to running a pizza business, through LinkExchange [acquired by Microsoft for $265 million], and becoming a venture capitalist before Zappos. Key takeaway: Focus on company culture & help employees grow both personally and professionally. One of my favourite business book is Delivering Happiness by Tony Hsieh. What I loved about it was that not only was it was insightful and filled with some thought-provoking advice, it was extremely readable. You see, I love reading since young, but I used to only read fiction books, and it took me awhile to make the conversion into reading business books. Delivering Happiness is one of the rare ones which reads like a storybook. A great journey behind the Zappos founder with strong focus on how to lead employees. The visionary CEO of Zappos explains how an emphasis on corporate culture can lead to unprecedented success. Pay new employees $2000 to quit. Make customer service the entire company, not just a department. Focus on company culture as the #1 priority. Apply research from the science of happiness to running a business. Help employees grow both personally and professionally. Seek to change the world. Oh, and make money too. Sound crazy? It's all standard operating procedure at Zappos.com, the online retailer that's doing over $1 billion in gross merchandise sales every year. In 1999, Tony Hsieh (pronounced Shay) sold LinkExchange, the company he co-founded, to Microsoft for $265 million. He then joined Zappos as an adviser and investor, and eventually became CEO. In 2009, Zappos was listed as one of Fortune magazine's top 25 companies to work for, and was acquired by Amazon later that year in a deal valued at over $1.2 billion on the day of closing. In his first book, Tony shares the different business lessons he learned in life, from a lemonade stand and pizza business through LinkExchange, Zappos, and more. Ultimately, he shows how using happiness as a framework can produce profits, passion, and purpose both in business and in life.